I made my annual early spring pilgrimage to some old favorite Class 1 WTMA waters. Just a quick look-see with some obligatory line wetting. Water was medium height, 42 degrees, and clear. I swung and stripped an articulated white mini bugger, but had no takers, nor did I see or spook any wary wild things. On the plus side, the rest of the world was working and I was fishing. There were signs of a healthy invertebrate population, namely midges and early grey stones. In fact, I saw a couple couples of the stones doing their mating dance, and one depositing her eggs. No photos because I left the camera at home. Please remember, no small stream fishing this time of year unless it’s a Class 1 (or in one of the allowed tidal zones). All thin blue lines re-open 6am the second Saturday in April (instead of the old third Saturday). Hang in there, folks. Spring is here. I could so go for some Hawaiian shorts and t-shirt weather right now. You know? 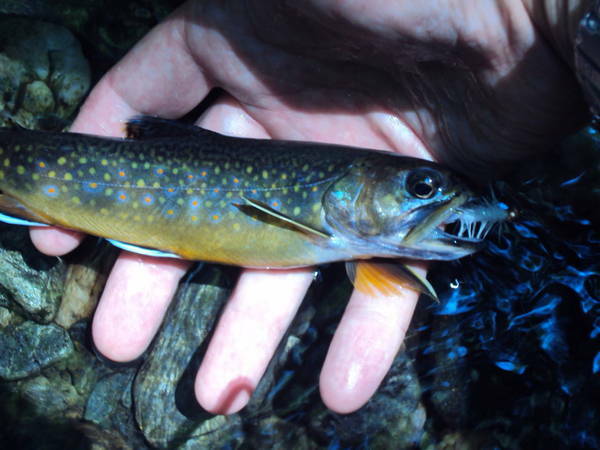 Last night I presented “The Eastern Brook Trout — Connecticut’s Wild Native” to the TU Naugatuck/Pomperaug Chapter. It was my second time speaking before the group, and a splendid time was had (I think) by all. Great to re-meet and re-greet, many thanks for the all the questions and, of course, the pizza. Wishing I was chasing him instead of being chained to my laptop. 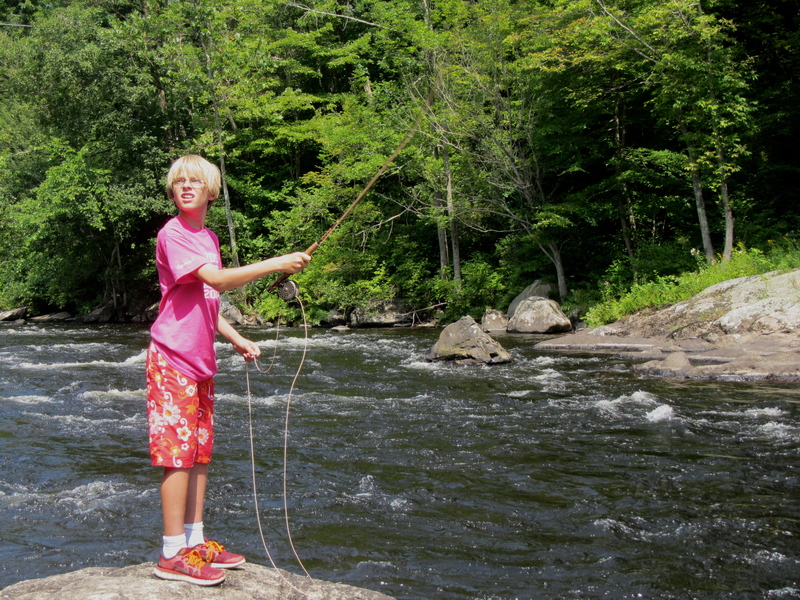 Gordon: How much farther is the river? Me: Not too far. It’s not really a river. It’s small, so we call it a stream or a brook. Me: Stop for a minute. What do you hear? Gordon: It’s coming from down there. Gordon: The water is cold. Me: Yes. Do you know why? Me: Well, is the brook in the open sun? Gordon: No, it’s in the dark woods. Gordon: I don’t think I can jump over to that rock. Me: I think you can. It’s OK if you get your feet a little wet. Gordon: It was shallow. I only got a little wet. Me: Look how flat and glassy that water is in that pool up there. Gordon: Can we go up there? Me: Do you remember what “the cafeteria line” is? Gordon: Where that white stuff is on top of the water. Me: Where did we hook all our fish today? 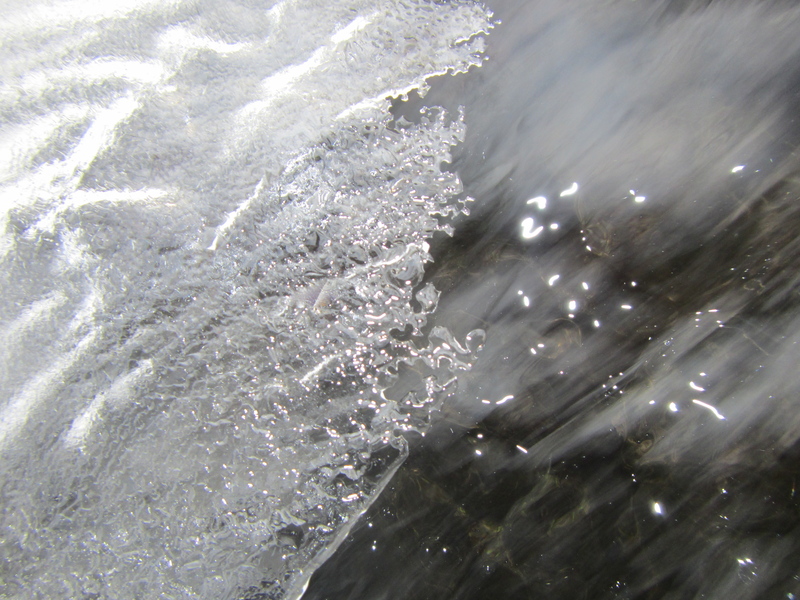 In fast water or in the slow water? Gordon: In the fast water. Me: I think we should get a burger at Five Guys. What do you think? Gordon: I think that’s a good idea, daddy. Gordon (no relation to Theodore) patiently presenting his dry fly over a pool. 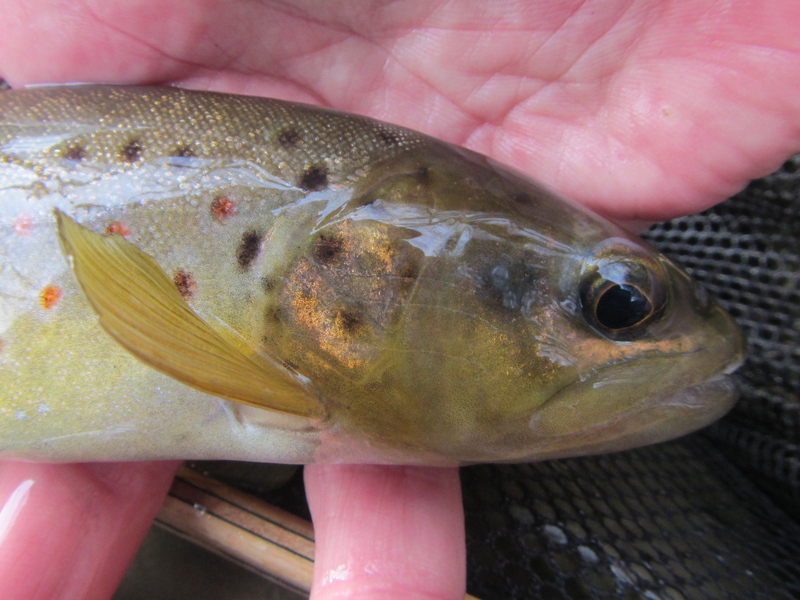 We didn’t bring any brookies to net today, but we pricked five. Not bad for one hour in the middle of a sunny day in July. I picked a cool, grey day last week to visit a stream in another state nearly three hours from my house. 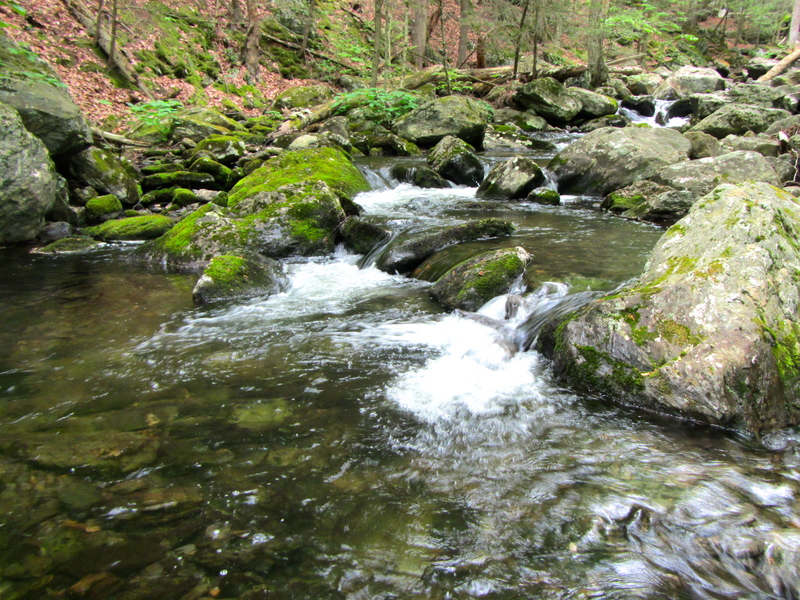 The water appeared to be on the low side of medium, and the brookies were looking up. While the subsurface downstream wet was effective — particularly in deeper pools and runs — the dry was eagerly and wantonly attacked by the local natives. I started off with a size 16 Improved Sofa Pillow, then switched over to a size 14 Ginger Elk Hair Caddis. On the way down, I used a black mini bugger and an ICU Sculpin. The cigar of the day was a Sancho Panza Belicoso. Delicious! Here are a few mementos from my adventure. 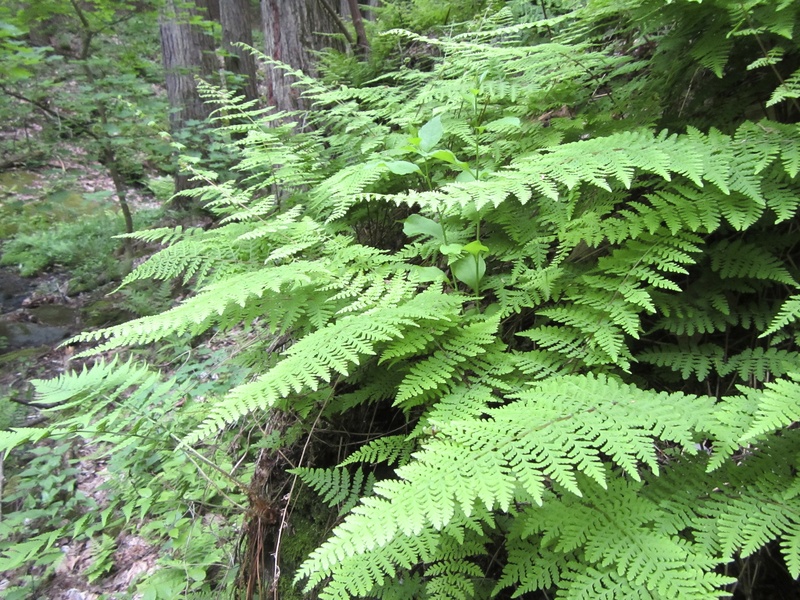 Contrary to popular belief, sometimes it is easy being green. This was a highly productive set of pools. I am always intrigued by the number of fish that can occupy any given area. Population density here was impressive. 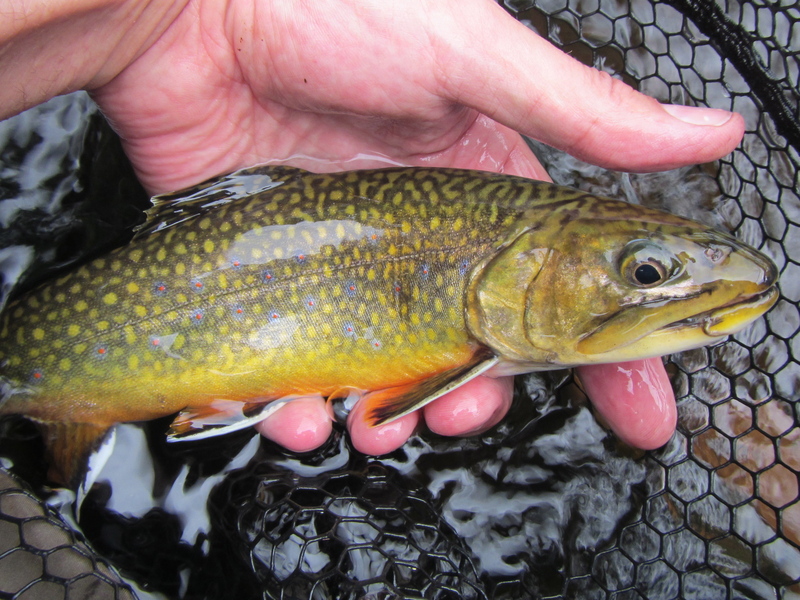 I often get to the point where I wonder,”how many photos of wild brook trout do I really need to take?” So I’ll try to ruthlessly edit my potential subject material. It needs to be a fish that stands out from the crowd in some way, whether its size, color, spirit, etc. 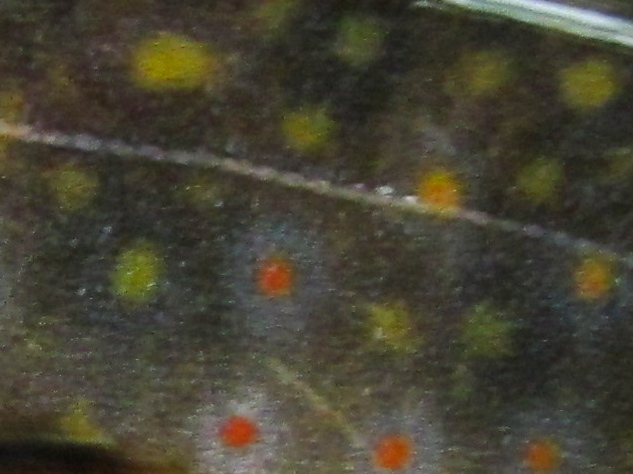 What caught my eye on this particular fish was the clarity of its lateral line. 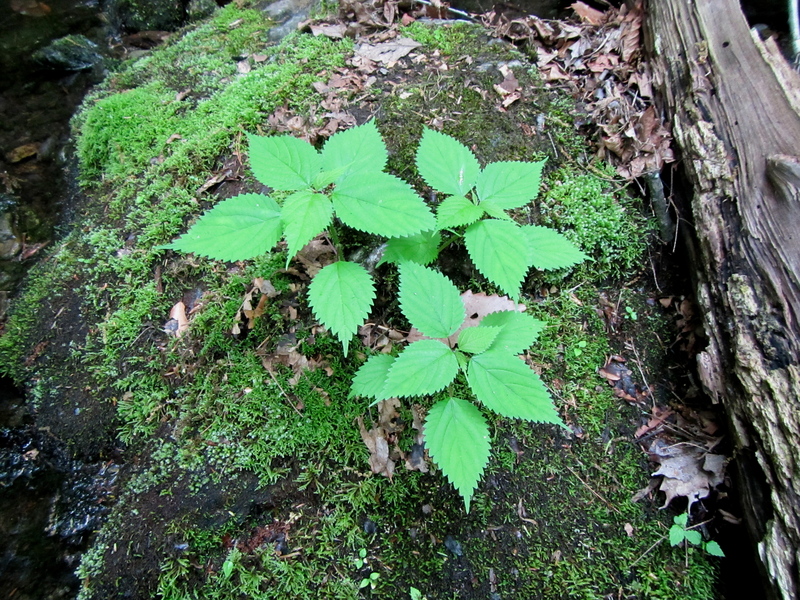 More of those “nature finds a way” plants that insist on proving that a boulder is a fine place to work and live. The point of release. Playing around here with a slower shutter speed. I like the static distortion of the water near head and tail. Big pectoral fins for a char that size. 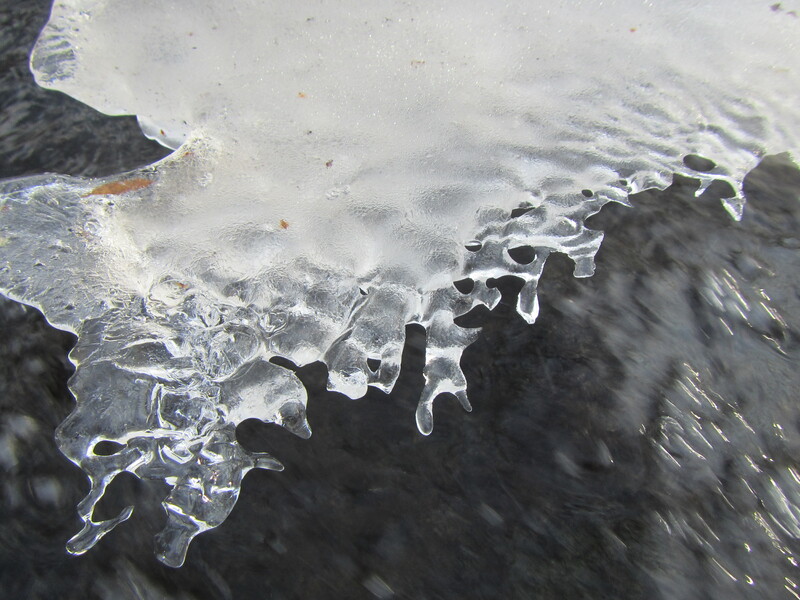 This time of year I redouble my efforts to visit small streams. The canopy is in full, providing cover and shade for bashful trout. Water temperatures remain moderate (especially after a cool, rainy spring like this year’s). Food sources are plentiful. 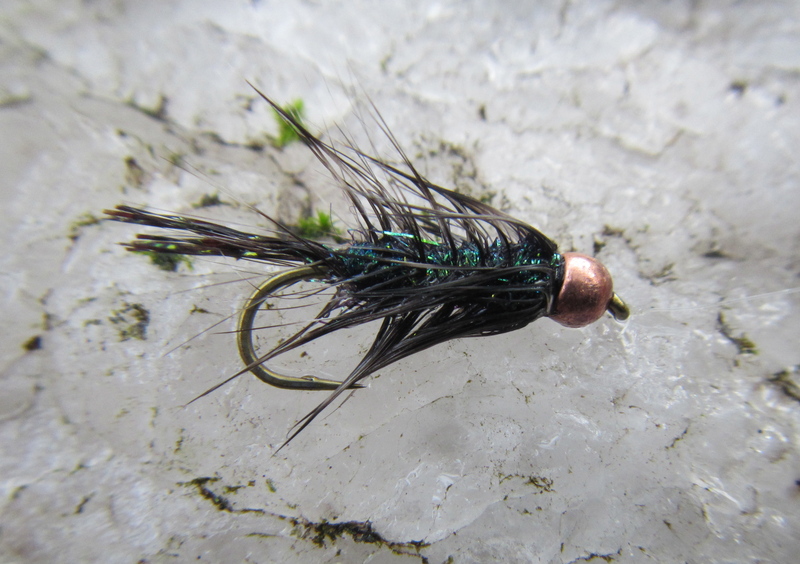 I don’t always manage to get out as much as I’d like, but small stream dreaming has me thinking about one of my favorite flies for wild trout, the White Mini-Bugger. Oh, it’s a Woolly Bugger alright. But I’ve made several strategic changes to the classic template. For starters, it’s just smaller, the easier to be eaten by trout measured in inches. The tail is shorter and sparser, which cuts down on nips away from the hook point. The hackle and collar is soft hen, which flows and breathes. With a tungsten head and wire underbody, this fly sinks like a stone, causing it to rise and fall like a jig when you strip it. If the light is right, you can clearly see this fly even in a deep plunge pool. Try not to laugh when you watch the shadowy marauders surround and pummel the fly as you work it through the depths. Tying notes: Of course, you can tie the Mini Bugger in any color your heart desires. I tend to be boring, so I mostly stick to white and black/grizzly. Same deal with beads: I have a thang for copper. (Thinking of tying some of these up in black with a copper bead for Salmon River steelhead? You should. It works. And with a chartreuse bead. And orange. And…) The shorter, sparser tail has absolutely increased my hookup percentage. To form the tail, I use a single piece of Krystal Flash, and double it/cut it multiple times to get a 16-strand tail. The body hackle is Whiting hen neck, the same I use for standard-issue wet flies. Tie the feather in by the tip, and if you have enough hackle after winding the body, try to form a collar. I broke one of my cardinal rules today: never go into the woods if you’ve recently watched Deliverance. 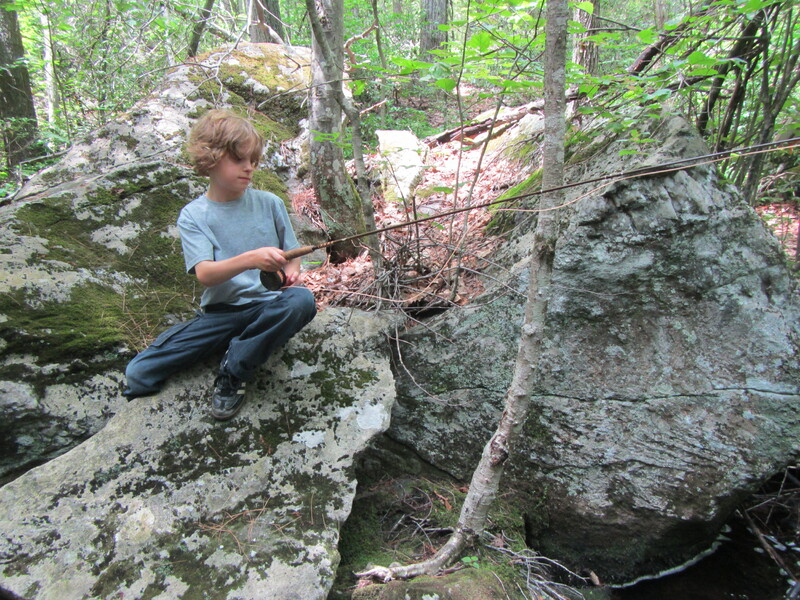 There were no mountain men bent on buggery — and sadly, precious few bugs. I was hoping a near 50-degree day and some sunshine would trigger a hatch, but all I saw was one lonely grey big midge/small stonefly thingy flitting over the water. Although the creek was up due to yesterday’s rains, the water had cleared nicely by the time I threw my first cast, around 1pm. A satellite image of the Chesapeake Bay’s frozen tributaries. Well, it could be. More fun with photography. See if you can find the duck’s head and the hawk’s head. My only strike of the day came on a downstream presentation with a weighted wet/streamer. A fine brown hen, long and lean, a good size for a brook this small. She was hiding in a deep pool that courses between two boulders. One touch was all I needed, and releasing her was almost as gratifying as catching her. Your first trout of the year should be a memorable one. What a staggering array of colors on her gill plate. Also note the blemish on her nose. I couldn’t tell if it was an old wound or just a cosmetic oddity. I had not caught her before today. I’m pleased to announce my first event for 2014: I will be returning to the Compleat Angler in Darien, CT for another tying demo. This year’s subject will be flies for small streams. Fishing small streams presents a unique set of challenges to the fly angler – and sometimes, fly selection (and size) is the difference maker. “Small Stream Flies for Wild Trout” will cover dries, wets, nymphs, and streamers that will help you build a basic kit for all kinds of waters, from shallow riffles on woodland brooks to deep plunge pools on high-gradient mountain streams. I’ll also discuss tactics and presentation. My demos are highly interactive, whether we’re doing Q&A or just talking fishing. Hope to see you there! This breathtaking beauty liked the look of a tan caddis skittering across the surface of a remote mountain stream. 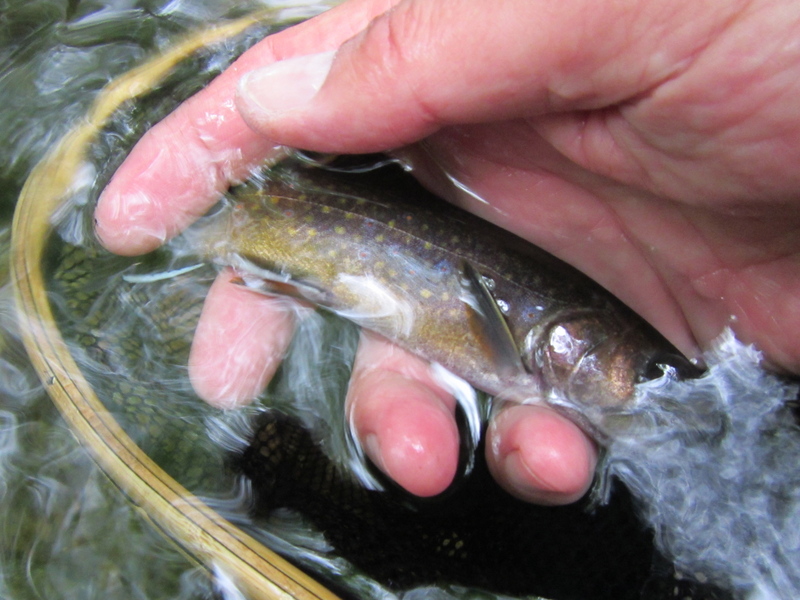 One of the things we’ll talk about is fly selection — dry or subsurface — and whether to fish up or downstream.